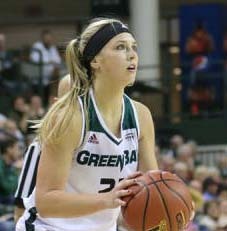 The Green Bay Phoenix women’s basketball team started hot, jumping out to a 16-3 lead. They went on to knock off the Marquette Golden Eagles 78-63 at the Al McGuire Center. Superior Junior Jessica Lindstrom scored a career-high 24 points and grabbed 12 rebounds to secure her fifth double-double of the season. Marquette attempted to rally in the third quarter and lowered Green Bay’s lead to nine points with 44 seconds remaining in the period, but the Phoenix withstood the rally moving forward. Mehryn Kraker added 19 points (7-of-12) and finished with a team-high four assists in 38 minutes. Allie LeClaire added 15 points. Sophomore Nitisha Hiedeman had 17 points to lead Marquette. The victory improved Green Bay’s all-time record against Marquette to 34-8, winning seven of the last eight meetings between the programs. The Phoenix next face mid-major power South Dakota State on Friday. The Wisconsin Badger women shot just 25% on Tuesday night at the Kohl Center, falling to Idaho State 42-35.